Exxon Mobil Corp. (NYSE: XOM) will report its fourth-quarter and full-year 2015 earnings on Tuesday, Feb. 2, and analysts are not optimistic. In fact, many expect this to be Exxon's worst earnings report of the decade. But as the world's largest energy company, investors are wondering how to handle Exxon stock following earnings. There's one major reason to keep Exxon stock in your portfolio, though, despite the bleak earnings predictions. Thomson Reuters analysts expect Exxon to post $0.66 per share on revenue of $52.5 billion for the fourth quarter. That would be a decline of 57.7% and 39.9%, respectively, from Q4 2014 – the biggest year-over-year drop since 2009. The dismal numbers are grounded in last year's oil price collapse. WTI crude oil's 37.4% decline in 2015 marked the first time in 17 years that the U.S. benchmark posted a second straight annual loss. The plunge caused Exxon stock to fall 15.7% and lose more than $21.8 billion in market cap in December alone. In February 2015, the company's prized Torrance, Calif., refinery suffered a huge explosion caused by pressurized gasoline-making equipment. The blast injured four workers and was equal to a 1.7-magnitude earthquake. Before the incident, the Torrance plant supplied one-fifth of southern California's gasoline. Now it operates at less than 20% refining capacity and has hiked the state's gas prices compared to the nationwide average. According to AAA's Fuel Gauge Report, the nationwide average price of regular-grade gasoline today (Jan. 28) is $1.82 per gallon. That's 30.5% lower than California's current average of $2.62. Exxon decided to abandon repairs and sold the damaged plant to PBF Energy Inc. (NYSE: PBF) for $538 million last September. Getting rid of its largest West Coast refinery is sure to cost Exxon millions of dollars in potential revenue. The missed revenue combined with record low $33 oil prices could send the XOM stock price into an extended period of volatility in 2016. Exxon stock is a worthy asset to keep for one reason – it offers one of the strongest and steadiest dividends on the market. The strength of Exxon's dividend comes from the company's S&P AAA credit rating. This rating indicates a company has a trustworthy credit history and enough financial stability to support its generous dividend policy. The 2008 recession caused many Fortune 500 companies, including General Electric Co. (NYSE: GE), to lose their cherished AAA rating. Now there are only three American firms with the rating – Johnson & Johnson (NYSE: JNJ), Microsoft Corp. (Nasdaq: MSFT), and Exxon. With a yield of 3.8% as of Jan. 28, the Exxon dividend is the best of the three AAA companies and therefore one of the best on the market. Exxon is also one of the few energy companies that's a "dividend aristocrat." A dividend aristocrat is a stock on the S&P 500 that has boosted its dividend payout for 25 consecutive years or more. The company has delivered a constant stream of quarterly payouts since starting its dividend policy in 1983. The dividend grew 5.8% from $0.69 per share to $0.73 over the course of 2015, making it one of the highest-paying oil stocks of the year. The Bottom Line: With another gloomy earnings report coming up next week, Exxon stock won't provide explosive profits any time soon. Shares are in for a rough year ahead as the company recovers from a year of crashing oil prices. 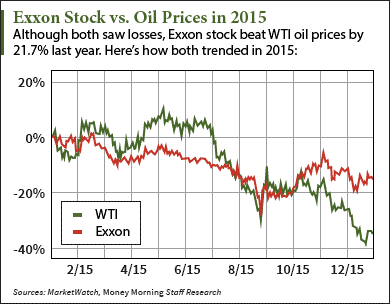 But XOM stock has one of the most attractive dividends in the energy sector. With a yield of 3.8% and quarterly payout of $0.73 per share, we recommend holding Exxon stock for its passive income benefits.